Drive through Newcastle and out to the harbour any weekend, and around high tide you are sure to find swimmers and divers enjoying themselves. There seems to be a dedicated group who swim here through the summer months and a few who swim all year round. The slipway at the side of the harbour wall is the preferred entry point, and it is a short swim out to the marker buoy and back. Feeling we would like a longer swim, Paula and I headed on out, past the harbour mouth and swam down the coast. Looking up at the steep sides of Slieve Donard, Paula pointed out the row of small cottages known as “Widows Row”. These were built for the widows of fishermen who died at sea. Instead of these women being thrown out of their homes after such a tragedy, they would be able to live out their days in one of the cottages looking out to sea. We swam on a little past the far marker buoy then retraced our course back towards the harbour where the kids, and some adults, were having a great time jumping and diving from the harbour wall. It was lovely to see that there are many people around the country still swimming in the sea for pure pleasure and entertainment, bringing their children along too so that the future generations continue the trend. Each year, around mid-August, the Harbour Charity Swim is run. On a Monday evening, swimmers will start at the Rock Pool and swim to the Harbour wall and back. This is a popular local event, and added to this, the Rock Pool opens during the summer months, with an evening swim on Thursdays. It felt nice to back at the open-air pool, where I first trained as a Swimming Teacher. 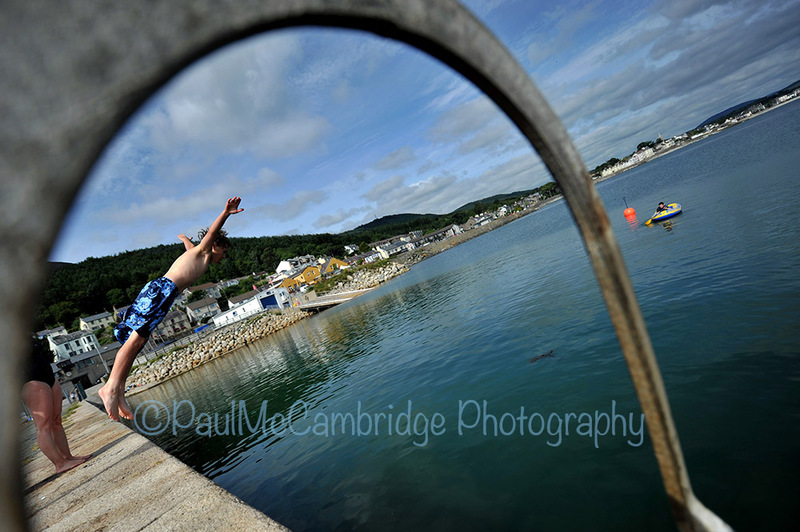 This entry was posted in Wild Swimming Ireland and tagged Boy, Co Down, Dive, Harbour, Ireland, Jump, Maureen McCoy, Mo McCoy, open water, Paul McCambridge, Sea, Sun, swim, swimming, water, wild, wild swim by wildswims. Bookmark the permalink.